Some Internet service providers have harsh restrictions on the amount of bandwidth you can use in a month, charging you extra if you go over your bandwidth cap. Other ISPs restrict traffic at certain hours — for example, offering unlimited bandwidth only at night. These caps can be frustrating in an age of high-quality streaming videos and services that depend on plentiful bandwidth. A few simple tips can help you make the most of that limited bandwidth if you can’t find a better ISP. Keeping an eye on your bandwidth usage is key if you have a fairly low cap and are worried about going over it. If your ISP imposes bandwidth caps on you, they should have a website you can visit to view your bandwidth usage. This is the best place to see an up-to-date count of how much bandwidth you’re using. Bear in mind that it may not update instantly, so you may have to wait a day or so to see the latest information. You can also try to track your own data usage. 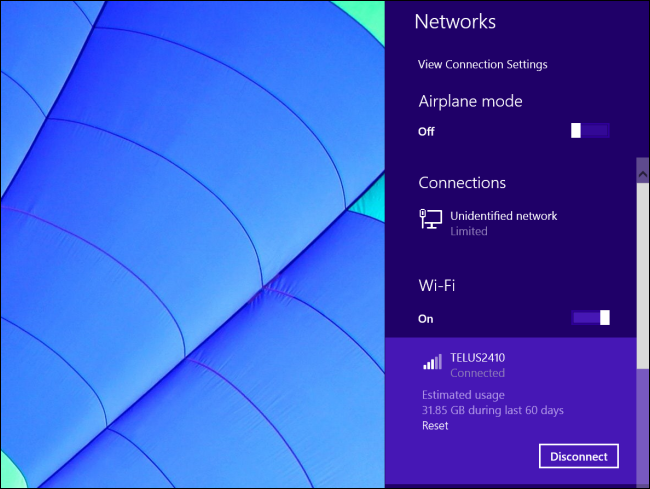 For example, Windows 8 has a bandwidth-usage tracking feature that can give you an idea of how much data you’ve transmitted in the last month. However, it isn’t the ideal solution — it will only track bandwidth used by a single computer, won’t exactly line up with your monthly billing period, and isn’t the number your ISP uses. If there’s a discrepancy, your ISP will trust their own number instead of yours. Video streaming can use a huge amount of bandwidth, with higher quality settings using a much larger amount of bandwidth. If you want to stream videos while not losing your entire bandwidth allotment, you can generally turn down the quality settings. Sites like Netflix and YouTube automatically select an appropriate quality level for the speed of your connection, and they generally prefer to use the highest quality level possible. However, you can usually turn down the quality while watching a video, or — better yet — permanently turn down the quality level on the video site’s settings screen. 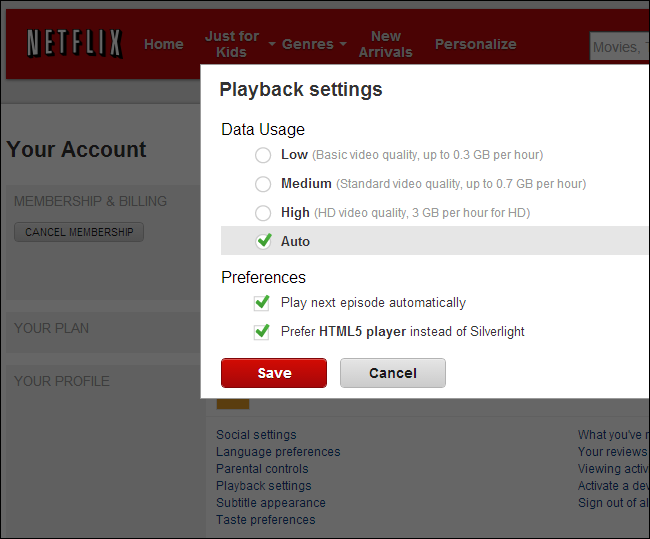 For example, with Netflix you can visit the Your Account screen and click Playback settings to select a data usage level. Low uses up to 0.3 GB (or 300 MB) per hour of streaming, while High uses up to 3 GB per hour. YouTube has a similar setting. Visit the Playback section in YouTube’s settings and select the “I have a slow connection. Never play higher-quality video” option. YouTube will default to slower videos even if you have a faster connection, saving bandwidth. You’ll typically find options like this on all video-streaming sites. When you start watching a video, you’ll usually find quality options in the player too. Keep an eye on video playback if you want to reduce your bandwidth usage — you can save a huge amount of bandwidth by watching lower-quality videos. Websites are becoming ever larger, heavier, and more bandwidth-intensive. But web browsers have quite a few options to help you fight back. Enabling click-to-play plugins will save quite a bit of bandwidth. Whenever you visit a site with Flash content, your browser will automatically download the content and load it. Most of the Flash content you’ll see will likely be ads. Advertisements are one thing, but wasting precious bandwidth on large, heavy ads is another. You can enable click-to-play plugins in browsers like Chrome and Firefox. 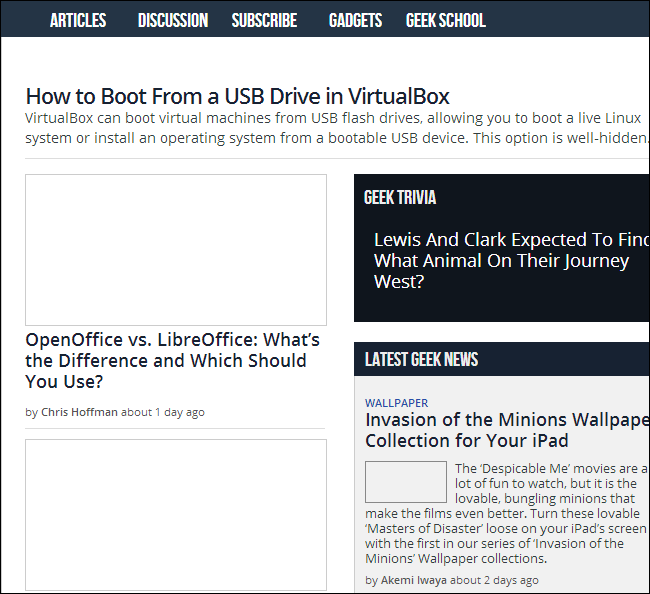 When you visit a site with Flash content, you’ll see a grayed out plugin box and you can click to download and load the content. There are also many other ways to restrict the bandwidth your browser uses, including preventing your browser from downloading any images! Tricks like this one are more useful when you’re tethering to a smartphone connection with extremely limited bandwidth, but they can help in a pinch. Bear in mind that, while images can be large, they’re not anywhere near as heavy as a streaming video or animated Flash advertisement. Some Internet service providers restrict the amount of bandwidth you can use during the day but allow you unlimited bandwidth usage overnight. The idea is that most people and businesses are using the connection during the day, but there’s excess capacity at night when people aren’t using the connection. Even ISPs that don’t limit bandwidth usage may slow down (or throttle) your connection during the day and speed it up at night. If you have a plan like this one, you can make effective use of your unlimited overnight bandwidth by scheduling downloads to take place overnight. Unfortunately, it isn’t possible to download Netflix videos for later viewing — only buffer them — so this will only help if you’re doing traditional file downloads. Try using a download manager to schedule downloads. Instead of downloading a large file in your browser, add the link to your download manager and have the download manager wait for later. Schedule the download manager to only download these files overnight using its built-in scheduling options and you can save a good chunk of bandwidth. Some programs — like the Steam gaming service — allow you to schedule downloads in their options window. 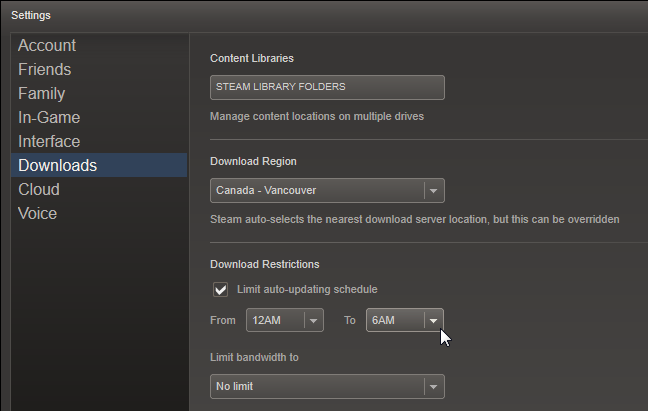 For example, Steam can automatically update your installed games only between certain hours you choose. Open Steam’s settings window and select Downloads to find this option. Look for similar options in other programs. Some programs — like iTunes — don’t have any built-in way to schedule downloads. You may want to just begin large downloads before you go to bed at night if you’re using these programs. Bandwidth caps are bad in the real world. The idea of charging users based on how much bandwidth they use isn’t necessarily a terrible idea — after all, it’s only fair to pay a bit more if you’re using a bit more. But, in reality, ISPs often charge an unreasonable amount of money if you go over the cap — it’s just another profit center for them.